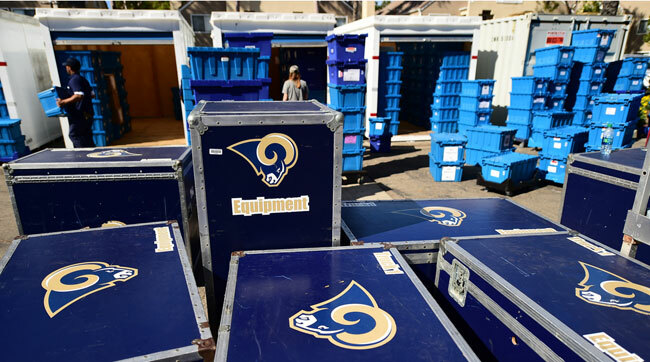 The gear arrives in Oxnard. Last Friday, Demoff took a brief tour of the caravan’s first stop: the sprawling Residence Inn campus in Oxnard, where the team will hold its offseason program (rookie minicamp, OTAs, top-30 visits, draft preparations) before most likely staging training camp at UC Irvine (the team and the school have yet to reach terms). 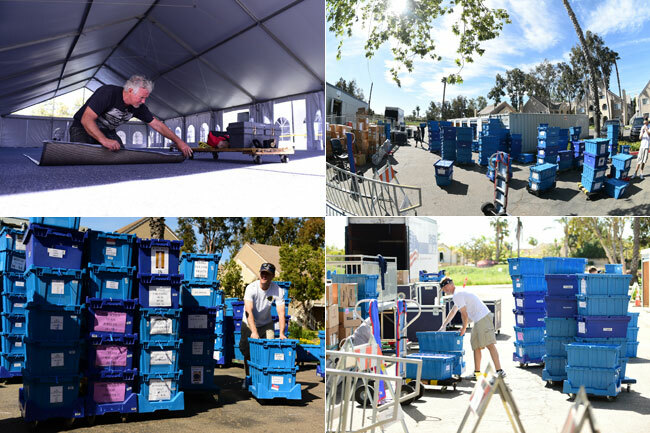 Demoff, the slender, Dartmouth-schooled executive, took a moment to soak in the Southern California sunshine before surveying the giant white tent that will serve as the weight room. Jokes aside, the Rams are taking every step to ensure players experience something close to business as usual when they report to work in mid-April. Three weeks ago the team received permission from the NFL and the NFLPA to hold a non-mandatory information session at a Manhattan Beach hotel. An officer from the LAPD was there to educate players on topics ranging from new drivers’ licenses and California traffic laws to local gun ordinances. Rams PR director Artis Twyman highlighted the media scrutiny players will be under in Los Angeles, a lesson that almost taught itself: Twyman showed a video on a projection screen of a TMZ reporter ambushing running back Todd Gurley at the LAX baggage claim just the day before. Coach Jeff Fisher brought in a couple of heavy-hitters, former Rams greats Eric Dickerson and Jackie Slater, to hammer home his most important point about living in the greater L.A. area: The traffic congestion is very real, and will be especially so during this nomadic season. The first stop for the offseason program is Oxnard, 61 miles up the 101 from downtown Los Angeles. At the end of the month, the football staff will relocate to a hotel across the street from the downtown L.A. Live complex; they’ll hold a week of scouting meetings before a draft event at L.A. Live. In July, players will move 105 miles south from Oxnard to Irvine (likely) for summer training camp. When camp breaks, they’ll go 84 miles north to Thousand Oaks, to the Rams’ in-season practice facility and offices. On game days players will commute 43 miles east to the Coliseum, just south of downtown. By the time a sense of routine is established, the Rams will play a “home game” in London on Oct. 23 against the Giants. That’s a nice little commute of 5,437 miles, each way. The players were advised, in no uncertain terms, to find housing arrangements near Thousand Oaks and the campus of Cal Lutheran, where the team will be headquartered for the next three regular seasons. Only one player on the roster has boyhood ties to the L.A. area—linebacker Akeem Ayers grew up in Watts, where he went to Verbum Dei High School. 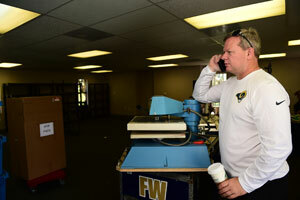 On the other hand, several Rams staffers are making their second move with the franchise. The team retained almost 100 staff members, including coaches, scouts and behind-the-scenes personnel such as Lake. 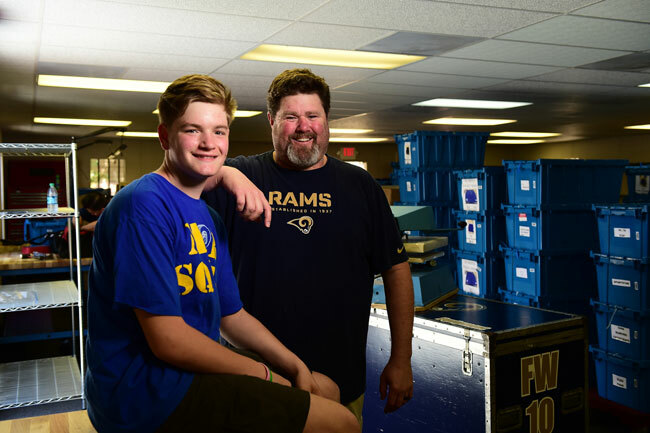 Jim Lake and his eldest son, Jonathan, at the L.A. Rams’ temporary headquarters in Oxnard, Calif.
For Lake, the decision to move was a no-brainer. He’s a Rams lifer who had already moved with the team once, in June 1995, when he packed his personal belongings into the smallest U-Haul trailer money could rent and towed it behind his Jeep. Back then he was an intern in the team’s equipment department, a 20-something who got his start shagging balls at practice and was a blip in a convoy that included 16 moving trucks to relocate to St. Louis. Bill Consoli, the team’s director of information systems in St. Louis, was among those who declined the offer to move to California. “He’s a genius-class intellect,” says director of video operations Larry Clerico, who was left to direct the loading of the “hot truck”—the 53-foot air-suspension straight truck with a 305-inch wheelbase that sent about $2 million worth of equipment, including computer servers, some 1,800 miles west on Interstates 40 and 15. That truck left St. Louis last Thursday and arrived late Friday night for a Saturday installation. Clerico woke up at 5 a.m. that day and didn’t stop working until 10 p.m., installing an information system that will be packed up and moved to the team’s training camp location in a matter of weeks. “Most days we’re spending between 10 and 16 hours here installing and getting everything ready for these coaches to get here,” he says. Bruce Warwick, the team’s director of operations, is a logistics guru who has worked with the Packers, Duke, Syracuse and Tennessee. He’s done the bulk of the legwork in building out new sites for the team’s move to California. He says he visited more than 30 sites that will have some bearing on the future of the Rams, all while keeping a mental catalog of minor details such as the color of the carpet in the training room tent (blue). That the Rams are in the position to be making demands in Ventura County is the work of Kroenke, and to a large degree, Cowboys owner Jerry Jones, who championed the idea of the Rams returning to L.A. and building a megastadium that will rival his own in Texas. It was Jones who invited the Rams to this Oxnard site, where the Cowboys have camped for years, for a few days of training camp last offseason. It was an eye-opening experience for players and staff. At the combine, “All the other teams’ staff were begging us for the [Los Angeles Rams] T-shirts,” says Walker. In St. Louis, Walker worked with general manager Les Snead and saw her role evolve from handling logistics for the personnel department to include players as well. A razor-sharp multitasker, Walker attended the owners’ meetings in January and heard Demoff’s presentation before the Rams delegation was asked to leave the room. Later she and a colleague toasted the L.A. approval with champagne, unsure if they were flying back to St. Louis or straight to California to begin preparations. Last Friday she wore one of the few Los Angeles Rams dry-fit T-shirts in existence as she pushed plastic crates up wooden ramps at the Residence Inn. For the combine in Indianapolis, the Rams brought a limited number of freshly minted L.A. Rams shirts to give prospects at the conclusion of their formal interviews. She successfully lobbied for one, but word got out and many other requests were denied. The love for the Rams is blossoming in California as well. As Warwick bounces from site to site, people are thrilled. They still can’t believe the Rams are back, he says. Everyone has a story, from the guy who attended the final game in 1994, to the guy whose father took him to the first game, in 1946. “People have been wonderful,” Warwick says. “There’s some connectivity that is unique to the Rams moving back here that I don’t think any other team could have.